A Chicago nonprofit seeking to end homelessness is proposing a substantial increase in the real estate transfer tax on high-end properties to fund services for some of the city’s most vulnerable residents. As part of its Bring Chicago Home campaign, the Chicago Coalition for the Homeless is proposing a transfer tax of $9.75 per $500 on residential and commercial properties that cost $1 million and up. (The current rate is $3.75 per $500.) The extra funds generated from the tax increase – $12,000 per property, at minimum – would go toward support services for the homeless, according to Julie Dworkin, the group’s policy director. CCH estimates the plan could generate $150 million per year and would impact just 5 percent of real estate transactions in the city and 3 percent of homeowners. That extra revenue “could decrease the number of people experiencing homelessness by 9,000. In 10 years, it could decrease by 36,000 people,” said Dworkin. CCH is seeking to get a referendum placed on next year’s Feb. 26 ballot asking voters if they would support the measure. Dworkin said 31 of the city’s 50 aldermen are in support of putting the question on the ballot. CCH plans to present its proposal before the City Council on Wednesday. City officials declined to comment on the proposal. According to a CCH-commissioned poll, two-thirds of 600 would-be voters in the February election said they would support the proposal. Nearly 80 percent of those polled said homelessness should be a top priority for the mayor and City Council, and that not enough has been done to address the issue. On Tuesday, Mayor Rahm Emanuel’s administration announced a $1.1 million investment in the 2019 budget to support homeless residents, including $705,000 for the continuation of a pilot program to assist those living in encampments. Chicago Department of Family and Support Services Commissioner Lisa Morrison Butler said the pilot program is not a cure for homelessness in Chicago, but a tool. “In a city this size where we do have encampments, it makes sense to have some special effort for them,” she said. 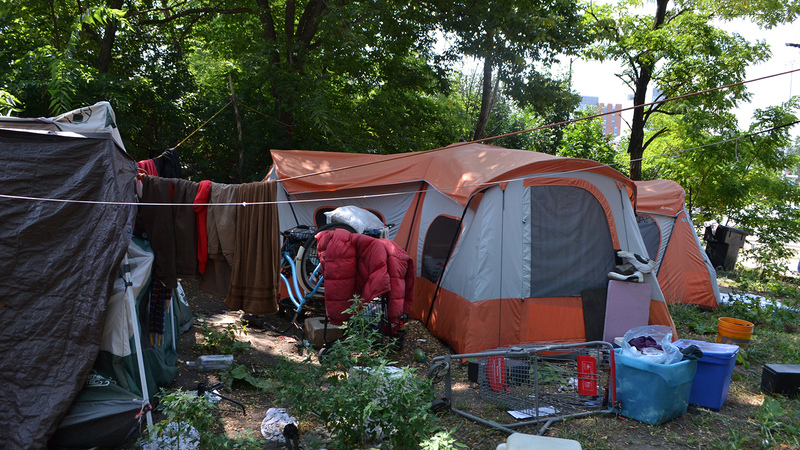 In April, city officials began making frequent visits to encampments in the downtown business district, which they say house about 200 people. Rather than visiting an encampment once every few weeks, “we tried to be really intensive and consistently be there every day for two weeks,” Butler said. Not only did officials conduct outreach during the day, but they also piloted overnight outreach. “If you don’t have dedicated efforts overnight, you’re often missing people when they come back,” she said. DFSS worked alongside the Chicago Police Department, Department of Streets and Sanitation and Department of Public Health during the pilot. Butler says that after learning why some people resist going to shelters, they opened their own low-barrier shelter that allowed people to bring their pets, partners and belongings with them. The city will increase the capacity of the low-barrier shelter from 30 to 40 beds in next year’s budget.